The new V2.2 BlingSling™, is a luxurious yet very strong Neck Sling. The new V2.2 BlingSling™, is a luxurious yet very strong Neck Sling. Featuring dual strands of Suede for extra strength, comfort and elegance. V2.2 BlingSling™ is perfect for all e-cigs from personal style Vaporizer to box mods. Styled with free-riding, decorative beads on *Suede cording for a playful and elegant appeal. Suede cording adds a softer more luxurious feel than standard cording. Also included is a 510 to Ego adapter/vape extender for use with any Ego style Atomizers. The extender will also provide assured connection to all atomizer (including sans adjusting screw on bottom). A beauty ring /thread cover (not included) can be used for a smooth finish over the 510 to Ego adapter/vape extender threads. 510 to EGO adapter included for use with EGO style atomizers. 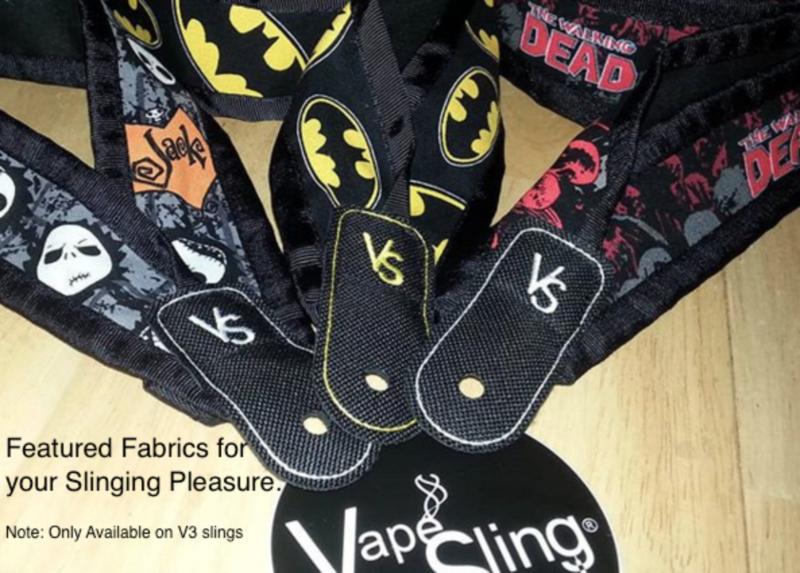 VapeSling® Canvas cradle is reinforced with a double layer of PVC for strength and liquid resistance.